The St. Louis Blues are a different team, top to bottom, than they were in the first half of the season. Their 3-1 defeat of the Vegas Golden Knights on Monday, just the second regulation defeat the Knights have suffered since trading for Mark Stone at the deadline, is proof enough of that. 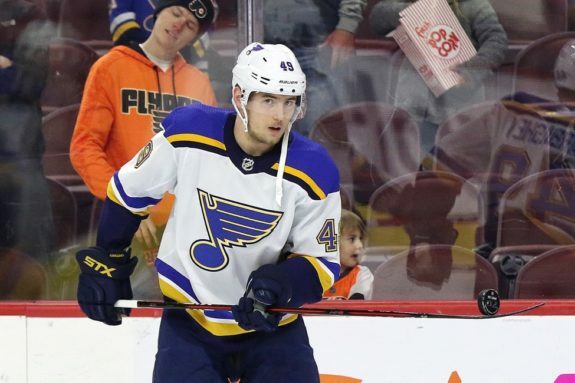 While lots of attention has gone to breakout players like Jordan Binnington and top performers who have turned their seasons around, like Jaden Schwartz and Patrick Maroon, the Blues have some secondary performers who have taken their game to a whole new level. One of those performers is third-year Russian forward, Ivan Barbashev. Despite his role on the fourth line, he has been making a major impact in recent games. Though it’s not all he’s done lately (as we’ll discuss), Barbashev was clearly in peak form against the Detroit Red Wings on March 21, when he recorded his first career hat trick. The first goal came on a chaotic play. After his teammate Alex Steen took a shot off the crossbar, Vince Dunn grabbed the puck and shot it wide. Steen then tried to jam the puck in from behind, with Red Wings goalie Jonathan Bernier blocking his pass, but Barbashev was perfectly positioned to knock home the final rebound for his first goal. The second goal was his most impressive. The Red Wings’ Michael Rasmussen had the puck along the half wall when Barbashev leveled him with a powerful, clean hit. Steen picked up the puck as Barbashev crashed towards the net. He received the pass, fought off Anthony Mantha from behind, and scored his second. The final goal was an empty-netter, but it was done with flair. Zach Sanford got the pass and was looking for Barbashev all the way as he headed for center ice. He lured the last defender, hit his teammate, and the rest was history, as Barbashev waited until he couldn’t miss and secured his hat trick. It was an extraordinary series of goals for the Russian, but it should not be seen as an anomaly. He’s been in exceptional form recently, and though hat tricks will remain a rarity, he may remain a much improved player going forward. The Blues have an incredibly versatile two-way forward in Ryan O’Reilly, one who deserves more recognition than he gets. But behind him, they have a secret weapon in Barbashev, who provides many of the same tools in a depth role. According to naturalstattrick.com, he has an individual point percentage (IPP) of 85.71 percent. The statistic measures the ratio of goals a team scores while a player is on the ice in which he has a point. 85.71 is a very high number, and it means that Barbashev drives much of his line’s play when he’s on the ice. Of course, that isn’t limited to the fourth line. Look at this play, when Barbashev tenaciously attacks Ryan McDonagh until he dispossesses him. The play gets overshadowed by Brayden Schenn’s remarkable goal, but it’s Barbashev’s forechecking and his alert pass to Vladimir Tarasenko that makes it all possible. Though playing in limited minutes, the Russian is eighth on the team in takeaways (33) and hits (82). He’s got the Blues’ best shooting percentage (24.1), as well as a team-leading two shorthanded goals. He is also a critical penalty killer, as he is second (amongst players with 25-plus games) in shorthanded Corsi for differential. Speaking plainly, this means the team kills penalties best when he is on the ice. All of these performance metrics are good news for the youngster, as he enters a summer where he will be a restricted free agent (RFA). While there are many numbers to support his value, fourth liners are not paid a premium. Realistically, Barbashev will make something in the $1-2 million range for the next year or two. But the Blues should not be afraid to pay their Swiss Army Knife of a fourth liner to keep him around. He provides grit, determination, penalty killing, and, on occasion, goal-scoring acumen, and that is a valuable combination in any player.